Teardown session of early stage product startups, who are still looking for product-market fit. Orchestrated by hand-picked facilitators, there were focused, interactive, deep conversations within small, curated groups. One of the things that stood in the teardown sessions is that more often than not, founders tend to be bogged down with confirmation bias. Despite best intentions, many entrepreneurs look to confirm hypotheses, rather than test them. This is called confirmation bias and may lead to false positives. For an entrepreneur, the danger here is obvious: without a clear understanding of the things that might cause your business to fail, it’s impossible to overcome them. Another aspect evident from the discussion was that we are often trying to do too many things, and this could be with respect to also adding too many features. To implement even one good idea takes a mountain of work–strategic planning, product development, marketing pushes, financing, administration, human resources, and so much more. Taking one idea to profits is hard. To be successful as an entrepreneur, you have to realize the devil is in the details. Don’t fall into the trap of trying–like so many entrepreneurs–to do too much. Another benefit of focus for startups is that it enables better marketing. The only way to get mindshare is to have a simple story. It’s hard to be succinct in describing several products. By having a clear and singular focus you can more easily craft a simple story that resonates with customers. This in turn makes it easier to generate PR. And most importantly of all, an easy to describe product and differentiation allows consumers to more easily tell your story and help you create viral growth. Shape your product or service offering – With this goldmine of information, a startup is uniquely positioned to shape its product or service offering to better cater to the needs of its target buyers. This can, for example, also help you decide the theme for your product landing page, color combination, UX intricacies etc. Content creation –Once you’ve understood the motivations, goals, challenges and habits of your users and prospective users, you can build content that is designed to address these goals. Your content will now be much more effective and will convert at a higher rate. Suresh from Kissflow showed an interesting slide on how KissFlow was divergent against its contemporaries. Founders need to have clarity on the key criteria their target persona will evaluate before choosing their product. It could be features, price, ease of use etc, and compare it with other players in the market. Think about this: Why do customers pay for your product or service? What makes it unique and better than that of your competitors? Your differentiation will stem from the insights you gathered about the problem or the customer which you uniquely believe no one else has. As an entrepreneur, you need to clearly differentiate between fact and hypothesis. You will make several hypothesis, but you need to test them before making accepting them as a fact. The most important element of creating a hypothesis is that it must be “falsifiable.” That means your hypothesis can be rejected after an initial experiment of the hypothesis. Second, all hypotheses should be quantifiable. In other words, you must be able to predict, account, and analyze your results. A good hypothesis includes both a question and good methodology to uncover the results. After determining the question and developing your methodology, you should then run a test to analyze the information obtained. You will be creating hypothesis related to several aspects in your startup journey, viz. product features, customer needs, website, pricing etc. And finally an important rule that founders need to imbibe by – Keep It Simple. This applies to your product, it applies to your website, it applies to user onboarding and perhaps almost everything. The single biggest thing that will attract customers to try you, atleast initially is trust. Trust that you can deliver and trust that what you say is true. Simplicity helps you build this trust. Shy away from unnecessary hype or claims on your website and don’t make it until you make it. All in all, PNcamp is a MUST attend camp for any early stage product startup. It is a unique opportunity to catch the brains of experts and fellow participants through product feedbacks and interactions. What particularly stands out within the iSpirt community and in this even is the candidness of founders and their willingness to share details about their journey. How to scale your startup successfully and make it Virat ! So India won against Pakistan in the world cup match….again. I’m sure none of you would have missed it for the world. As you watched every ball with your heart in the mouth, you would have noticed some players performed while others faltered. But in the midst of it, one man stood tall. Virat Kohli, once again proved that he can perform in the toughest of conditions against the best of teams. So what makes Virat Kohli click where other great batsmen stumble ? Similarly, you see some startups stagnate while others scale consistently. Is there any method to this madness ? Successful startups who scale are ones who continuously try to improvise, holding on to their strenghts while improving their weaknesses. They build a process driven organisation fixing bottlenecks as they grow. Virat Kohli also worked hard to improve as a batsman, mastering his weakness against the short ball, and learning new strokes even though he was successful without them. Every player starts his international journey with a few apparent flaws. While some work diligently to remove them, others work around them. Then there are those who become victims of their own flaws before they can eliminate them. Similarly, startups who take early success for granted, fall and ultimately perish. So how do I successfully scale my startup ? When do I know that I’m ready to scale ? Which countries and verticals do I expand? Should I grow organically or inorganically ? Is enterprise selling important ? How do I build a successful sales team with predictable pipeline ? How does channel sales work? All this many such pertinent questions must be bothering you when think of scaling your startup ! This is why a bunch of successful startup founders met to discuss and understand the process to scale. 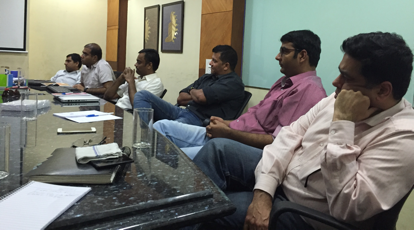 The 63rd iSPIRT round table on “Scaling Revenues” was led by Aneesh Reddy, CEO Capillary technologies on 13th March, 2106 at Knowlarity, Cybercity office. Ambarish Gupta CEO Knowlarity was the host and also a participant. I was fortunate to participate as an iSPIRT volunteer and met some of the great startup founders there. One of the first fundamentals you want to know is that when do you know you are ready to scale ? Now that you are ready to run, faster than the fastest, which market do you expand. India being an easy access, most SaaS founders start with India unless they have a cofounder in US or some associates. So is India the right market to start with ? There are multiple schools of thoughts here. Like Ambarish from knowlarity mentined that they built the company with clients from India and scaled it to a level where their core sales team and processes were established. The initial days of scaling are tough so if you have good acess to clients it can be really useful. Knowlarity then expanded to similar geo’s like Phillipines, Singapore and Malaysia which are english speaking and have similar business culture like India and other ASEAN countries. Another interesting aspect of selling to US clients came up from Abhinav from Innovacer (watch out, innovacer might be the next mu-sigma in the making ! ) who have mastered the art of leveraging US based events to build a pipeline. Abhinav shared how they build an US events calendar and take up nominal booths there to meet larger base of prospects there. Its well planned and meetings are lined up with delegates much in advance. Event particpation helps in spending time with prospects away from office workload wherein the clients are also in a frame of mind to evaluate options. But you need to ensure, enough homework is done and meetings are planned in advance. Sachin Bhatia also shared similar experiences and vouched for importance of event participation to reach US clients. The next question was the importance of enterprise sales and larger deals. How do you increase your average deal size and sell higher to enterprise clients? Lets admit it. Everyone likes enterprise clients. They have the apetite to invest big and also act as a testimony for your product to scale. Aneesh shared his experience around selling to enterprise customers. The deal ticket size can be increased in multiple ways . First – you scale horizontally ie you can upsell and cross-sell. Which means you need to build multiple product modules which can be sold to same clients over the years increasing the account revenue. Next you can scale vertically by intially selling to a pilot base and then expanding into the account. For eg you can sell it to 10 retail outlets and then expand to 200 later or sell to one office and then expand to other locations. Enterprise selling needs you to have the scale or options built into your value proposition. Build new complimentary offerings every year. Channel Management was the another crucial aspect discussed. Dinesh Gupta of Busy software(www.busy.in) led the discussion. Busy competes with Tally as a market leader. They built and scaled a product in a market where tally is a houseold name amongst Chartered accountants their key evangelists. Couple of important points amonst many pointed by Dinesh are here. Firstly, Identify partners for whom your product and revenue are substantial part of their business. In other workds they need to have their skin in the game. Otherwise you’ll end up having a lot of channel partners but no sales. The other important aspect of channel sales is to educate the partners. Education helps twofold. It creates a buy-in amonst the partners who can then sell better. Plus it helps them put the value proposition better in front of their customers. The group also discussed channel margins and how much to pay. While it was a long discussion, the crux of it was that you should pay partners well , may be more in initial days to get a foothold in new markets. It has to be enough of a motivation for them to sell. Subrat Krar from Vidooly also shared his experience on how they are leveraging marketing agencies as channel partners to expand their video analytics software. The team also spent some time discussion the sales team structure, hiring VP of Sales and how to build a scalable predicable pipeline. From what I gathered, it seemed that setting up an inside sales team is no brainer. It’s a must have. How to ensure it delivers is a larger discussion for which you might want to talk to an expert amounst people above who have scaled or to Sachin bhatia who has a product in the same space. But to build a sustainable pipelines, you need to also put the right metrics in place for the sales team. Eg the inside sales team should be measured on fixed demos, the sales team on closures. Few participants discussed sales quotas for sellers ranging from 1:4 to 1:10 of the CTC. Tushar from Empxtrax and Ketan from Mettl also shared their insights and metrics on hiring costs and metrics. Depending on the product and brand pull it may vary. Ultimately it should not be so much of stretch for the seller that he does not even feel like trying nor it should be so easy for him that he does not get the aldrelin rush while closing a deal. You need to find your sweet balance. Premium/Free Trial vs no pricing mentioned on website was another aspect discussed. Different people have different models but largely the group agreed that most are moving away from freemium and those targeting enterprise do not prefer to display the price on the site at all as it varies by scale and need of clients. Aneesh also shared his views and experience on attaining inorganic growth. Capillery having recently acquired MartJack, an esablished online ecommerce software company was best placed to answer it. Aneesh mentioned that any new startup takes 1.5 to 2 years to establish their product market fit and then to scale to a level where they are ready for enterprise sales. If you want to continuously increase your client revenue share and grow the market, inorganic acquisitions help you in cutting the time to the market. This then helps you focus on other aspects of scale. Overall another wonderful round table by iSPIRT. Need to thank our man Avinash for arranging the round table. He is like Tendulkar, silently but strongly delivers what his fans wantJ. 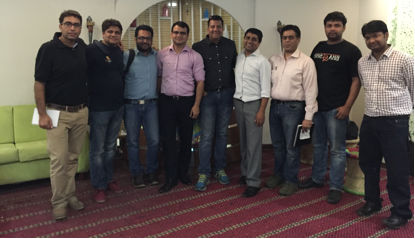 Special thanks to Ambarish for hosting us at Knowlarity and for his insights into scaling startups. Finally, many thanks to Aneesh and Anant from Capillery for leading such an interative round table and sharing deep insights from their business. But you guys have nothing to fear. Take the leap of faith as you step forward to take your startups to new heights. Happy Scaling guys ! And India will surely Win the T20 World Cup ! – Native apps are deployed via the marketplaces, making MVP and beta releases very difficult. – The app stores, especially iTunes, has a review cycle which means apps are available download only after a period of time. Therefore companies aren’t able to experiment as quickly or thoroughly as they are on the Web. Every app release is a gamble that relies on the assumption that every aspect of the release will appeal to the app’s audience. If it doesn’t, or if there’s a problem, filing an updated version of the app and having it reach the marketplace can take days or weeks. Developers and product managers need to see how small changes affect engagement, retention, lifetimes value and, of course, monetization of their apps. AppIterate intends to solve this problem with their WYSIWYG A/B testing platform for native mobile apps. It allows app publishers to A/B test and iteratively optimize their designs/UX and functionality of their mobile apps to improve in app purchases, user engagement and conversion metrics. It also allows app publishers to run tests and deploy based on user segments and see real time conversion metrics. Some of the main features of the app include Real Time A/B testing on native apps, using which developers can test new designs, copy, call-to-action buttons in real-time and push the winning version to all the users without pushing a new update to the app store. Feature Testing and Roll-back is another feature using which developers can test new Features, UX-flows etc during an app update process on a sample population. If the feature does well, deploy it to all of the users, otherwise roll-it back, all without pushing another update through the app store. Many a times, small changes to the app are required, like a change in copy, change in phone number, increase/change in size/position of a button. The service also gives app-publishers, the ability to make these changes and push them to the users live without re-submitting the app to the app store. Segmentation lets you target a subset of your users based on the criteria defined by you. You can target users based on their OS version, activity, location or any other custom criteria defined by you. Thanks to WYSIWYG editor, even Marketers and Product Managers can create A/B tests easily without any knowledge of coding at all. Mobile A/B Testing has seen a flurry of activities in the last few months. This includes startups with venture backing such as Apptimize, Swrve and Leanplum. Most of these allow publishers to do A/B testing on native apps using a web interface and get interesting analytics. Other rivals include Pathmapp and Bees & Pollen. There also players such as BetaGlide which can also measure CPU and memory consumption of an app while it is running and can track it against an event. AppIterate is a WYSIWYG A/B testing platform for native mobile apps. It allows app publishers to A/B test and iteratively optimize their designs/UX and functionality of their mobile apps to improve in app purchases, user engagement and conversion metrics. It also allows app publishers to run tests and deploy based on user segments and see real time conversion metrics. On April 21st, Avinash and I had a telephonic chat with Tanuj Mendiratta on the story behind Appiterate, their current traction and future roadmap. Q. Could you give our readers some background about Airwoot and how you started the venture. [Appiterate]: Appiterate was founded by 3 cofounders who were each pursing different paths. Anuj and I started working on DSYN while I was still studying at IIM Calcultta. Anuj was my batchmate from DCE. We figured out the in the mobile space a lot of tech was happening but nothing much on design. DSYN was trying to fill this gap. By December 2010, we had signed up a few clients including the likes of Vodafone. We both, then decided to skip the placements. We soon got in touch with Mayank, an IITD grad, who was working on tech offerings in the similar field. Given our complimentary offerings, we decided to partner together. We grew the services company to 35 people, with more than INR 2 Cr annual revenue and signed up clients such as Zomato, Ixigo, Sears, P&G etc. Q. How and when did you decide to pivot from a services company to a product company? [Appiterate]: Our services business was growing pretty well. But we wanted to scale quickly and build a big company. A lot of interesting things were happening on mobile, and with age at our side, we wanted to experiment with something that could grow big quite fast. We also felt that running product and services together was impossible as it meant compromising on the services delivery. We started working on a product in January 2013. By middle of last year, we raised funding from SAIF and by October we closed down the services business completely. Q. What happened once you decided to close down your services business? [Appiterate]: Once we decided to pivot, we felt the need to hire a completely new team as working on a product meant different skill sets and approach. However, we worked with every employee to ensure that they were able to transition to positions at other companies. This included working with our clients to absorb some of engineers as well as conducting interviews at our office for our employees. Q. Was the decision to close down services business completely triggered by having investors on board? [Appiterate]: No, it was a completely internal decision. We wanted to purely focus on product. Q. How did you identify the product that you wanted to focus on? [Appiterate]: During our services business, we interacted with a lot of clients to figure out what they were looking and whether we could productize any of these. We figured out that there was no platform in the market that allowed companies to interact and manage relationships with their users for their mobile apps. Hence we narrowed down to Appiterate. Q. In terms of your approach and mindset, what did it mean to pivot to a product company? [Appiterate]: There is a mindset challenge that you need to overcome when pivot to a complete product based company. With services, revenue was coming in steadily and we were a decently established profitable company. From this we moved to a company with no customers and start building out a new product from scratch. Q. There are a couple of other A/B testing platforms that have come up, so of the backed by accelerators such as YC and TechStars. How do you see them? [Appiterate]: There are a couple of startups that have come up in the silicon valley offering an A/B testing platform for mobile. This is a good validation for us about the market opportunity. However in terms of product, we believe we are more refined than the other players. Q. Which is your current focused market? [Appiterate]: We are focused on the global market. At the same, the Indian ecosystem has also matured, and we are seeing traction here as well. Q. Given that you do not have presence elsewhere, how are you tapping the global market? [Appiterate]: In today’s globalized world, location does not matter. We travel to meet our potential customers, organize webinars etc. to get in touch with and explain our offerings. [Appiterate]: Our current team strength is 10 and that includes some brilliant folks. Q. What is Appiterate’s business model? [Appiterate]: We are offering our platform on a SaaS model. Q. What does Appiterate’s roadmap look like? [Appiterate]: A/B Testing is just the start for us. We want to help app publishers better monetize post download. We want to be a CRM for mobile apps wherein a product manager can manage all communication with the users. Q. What is your marketing strategy? [Appiterate]: We intend to use both inbound and outbound marketing and position ourselves as a complete relationship management platform for mobile apps.